In direct marketing, farmers often depend on matching their prices to others at the market, or even what customers are willing to pay at a particular market. Sales are calculated across the market day. A rule of thumb is to aim for $1000 of farmer’s market sales per day to make it worthwhile; some analyst estimate as high as $1500. However, that does depend on where the market is, time of year, staff needs at market and your own volume of production week after week. For instance, strawberry producers are likely to have a narrower window of sales, and would need higher volumes. Strawberry jam producers could sell all year, and might have higher sales during the winter holidays. The Greenbelt Farmers’ Market Network offers this excellent resource for producers to make realistic estimates about the cost of doing a market. Although the course focuses on going beyond direct marketing, most farmers who are expanding from direct will continue to do some of their direct sales. This resource can help you decide which if any of your farmers’ market should be continued. The Greenbelt Farmers’ Market Network offers this excellent resource for producers. Click to download this Word document. 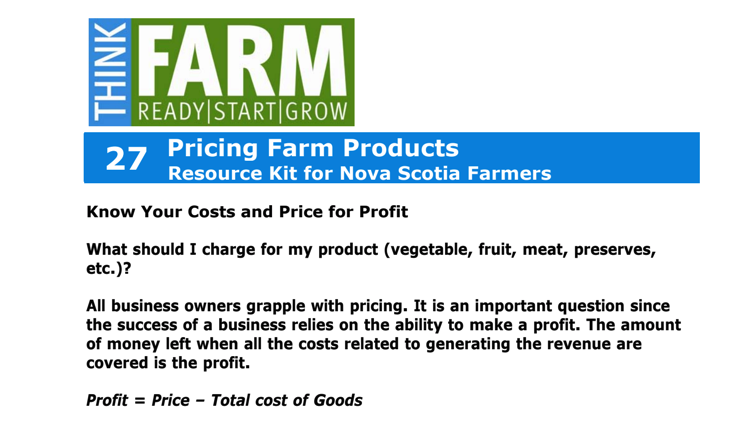 In this resource from the government of Nova Scotia, definitions and recommended costing practices are described step by step. Click to download this PDF. As you explore indirect markets, there is less flexibility in the pricing, and more to lose if you get it wrong. If you sell two bunches of carrots for 5 cents at the farmers’ market by mistake, you can always correct it next week. But if you sell a pallet load at that price, it will affect the income for the year. So more detailed pricing calculations are essential at this stage. The following resources can help you; as noted in the summary, it is essential to choose an approach that you know you have the capacity to maintain. A detailed calculation may take so much time that you never go back to it. Another consideration is your own interest and abilities as defined in the Vision and Goals section; if you don’t like one part of the business, is there someone else on the team who could take it on? If not, you should ensure that you do the work in manageable pieces, interspersed with work you enjoy. Numbers are part of running a business, so this is the time to become familiar and comfortable with them; don’t delay so that you have to stay up all night to get it done. Take your time; this will also reduce the chance of error. Although it is tempting to stop when you have gone through a spreadsheet once, it is highly recommended that you or someone else check the work. This can set the stage for years of reduced risk and fewer nasty surprises at the bank.